Violence in Honduras is sometimes presented as random and wanton, or as somehow involving drugs. During his inauguration speech on January 27th, Honduras’ new President Juan Orlando Hernandez said that approximately 70 per cent of homicides in the country are linked to drug trafficking. Dead bodies are routinely publicly attributed to gang members, regardless of the evidence and circumstances; and residents of the country’s biggest cities are under the firm grip of social control enforced by terror and threats meted out by street gangs. But according to a recent report put out by human rights organizations, only one per cent of crimes in Honduras are followed up by a police investigation. What Juan Orlando doesn’t want to admit is that an important number of killings in Honduras are politically motivated attacks on peasants, poor people, political activists, journalists, and queer and trans people.The murder of Durón Raudales is one of at least 38 killings of people actively involved in electoral campaigns leading up to November’s election. Among the parties, the hardest hit by the violence has been LIBRE, the leftist party led by former Liberal President Manuel Zelaya, who was ousted in a 2009 military coup. The intense political violence reflects an overall trend in Honduras, where according to the United Nations Development Program, the murder rate climbed from 37 per 100,000 in 2004 to 77.5 per 100,000 in 2010, the highest in Latin America by over 10 points. “Drug trafficking has been a pretext to militarize, because in reality the amount of trafficking hasn’t fallen, but because of narco activity there are now military bases in La Mosquitia, for example, and there are more bases than ever. [It’s a] US occupation, and narco trafficking is the pretext,” said Berta Caceres, General Coordinator of the Council of Indigenous and Popular Organizations of Honduras (COPINH). For Caceres and others involved in land struggles around the country, the militarization of Honduras brings with it direct and deadly consequences. Tegucigalpa, Honduras’ bustling capital, is an example of how modern mafia control functions in the Americas. During the day there’s plenty of activity in the streets, but once night falls the place goes eerily quiet. Taxis, which can be hired as shared vehicles (at about $1.25 a ride) or privately, proliferate. Typically taxi drivers are a source of information only for the laziest of journalists. But in this city, it makes perfect sense to seek out their views. For one thing, taxi drivers are among the only residents who will talk about the gangs, as drivers are required to pay quotas, usually weekly, to either the Mara Salvatrucha (MS-13) or the 18 Street Gang (M-18), the two most important street gangs in the city (and sometimes to both). Whenever I was alone in a cab, I asked the driver about the quotas. They were all forthcoming, and they all said the consequence for not paying is simple: death. I met one young driver who paid US$200 a month in extortion, a weekly payment of $25 to each of M-13 and M-18. It was, he said, more than his monthly rent payment. But pay he did, every Saturday, in both of the taxi sites he worked from. Cab drivers are far from the only segment of Honduran society living in fear of street gangs, but they are the only people I met with the privacy to talk about it in their workplaces. Gangs regularly extort small and medium sized businesses and working people throughout Tegucigalpa and San Pedro Sula, Honduras’ second city. People in these environments don’t dare to even hint that they’re being extorted, for fear they will be overheard. So they pay, and they try to get on with their lives. The biggest shops, US fast food chains and grocery stores, are the only ones who seem to get away without paying the so called “war tax” to gangs. According to the U.N. Office on Drugs and Crime, in 2012 there were an estimated 12,000 gang members in Honduras affiliated with MS-13 and M-18. A critical mass of politicians, prosecutors and police are in the business themselves, taking a cut of the illicit earnings in return for turning a blind eye to gang activity. Marvin Ponce, the former Vice President of Congress, said in 2011 that at least 40 per cent of Honduran police are involved in organized crime. The pressure that gang and police violence puts on the poor is intense. Earlier last year in Coatzacoalcos, Veracruz, I interviewed a 33 year old Honduran man sitting under a tree beside the railroad tracks waiting for a cargo train to take its leave toward the north. He only gave me his first name, Alexander, which he backed up by showing me a battered copy of his student identification. Alexander was leaving a full time job at a maquiladora in San Pedro Sula, fed up with paying the “war tax” to gang members every week on his $100 weekly salary. Others that I met along the way admitted that part of the reason they were leaving Honduras was because of the violence and extortion. Without remittances from Honduran migrants working outside the country (mostly in the US), poverty would be much worse, according to Hugo Noé Pino, a former Finance Minister and ex-President of the Central Bank. In 2012, he said, migrants sent home around $2.8 billion, in 2013, $3.15 billion. “That is almost the equivalent of two thirds of the central government’s budget,” he said. Today over 700,000 people of Honduran origin live in the United States, and only about two in 10 are US citizens. This brings us back to how the discrimination faced by this community in the US has led Honduras to where it is today. Gang activity in Honduras has a history that reaches back across the border to the US. Both the M-13 and M-18 gangs were initiated by people deported to Central America from the United States. Their ranks swelled in cities like Tegucigalpa as a Clinton-era policy of double punishment (deporting undocumented migrants after they’ve served a prison sentence, even if they’d spent nearly their whole lives in the US) came into play in 1996. Imposing the prison system on jailed youth and then deporting them has strengthened these groups. Though far more established than many cartels, street gangs are often portrayed as junior players to Mexican drug trafficking organizations, like Los Zetas. Here’s an example, from the United Nations Office on Drugs and Crime: “The Zetas are chronically short of manpower, and so may recruit mareros [gang members] with promise, but on an institutional level, they will most likely continue to use the maras instrumentally.” Being there in Tegucigalpa trying to do interviews with people about the violence, I couldn’t help but notice uncanny similarities between gang controlled areas and places said to be run by groups like Los Zetas: residents and victims terrorized into silence, the charging of regular extortion payments, the involvement of local police in criminal activities, and street level surveillance on a street corner to street corner level. But the Maras have a much longer history than a group like Los Zetas, which have existed as a totally independent organization for less than a decade. In so many ways, it seems like rather than the Zetas attempting to integrate mareros into their membership, it’s the Central American street gangs that provide a model for territorial control and for building a long term economic strategy that is not tied to drug shipments. Such organized crime, violence and state collusion has clear political implications for activists in Honduras. In 2003, the Honduran government under National Party President Ricardo Maduro adopted anti-gang legislation which allows police to pre-emptively arrest people based on their social networks. “We passed the ‘anti-maras’ law. It’s actually an illicit association law. What it is, in layman’s terms, is conspiracy to commit a crime,” Oscar Alvarez, Honduras’ former Minister of Security, told InSight Crime. On October 23rd, 2013, Honduran Military Police raided the home of Edwin Espinal, a member of the Libre Party and a widely known community activist. The warrant authorizing the raid allowed police to enter Espinal’s house to search for drugs and weapons (neither were found during the raid). Activists criticized the government for using drugs as a pretext for political persecution. Much reporting on the violence in Honduras does not include a detailed analysis of the economic situation in the country, particularly the widening chasm between rich and poor. Since the 2009 military coup removed President Manuel Zelaya from power, the number of people in poverty has increased significantly in the small Central American nation. The Center for Economic and Policy Research released a report in late 2013 showing that Honduras is now the most economically-unequal country in Latin America. Honduras’ tiny elite runs the country’s maquilas, owns the media, and controls the telecommunications, banking, and energy sectors. “It is an elite that has diversified its investments, and whose principal characteristic is the use of the state as a mechanism either of direct accumulation or of the facilitation of accumulation,” said Hugo Noé Pino, a former Finance Minister and President of the Central Bank. “It is an elite that does not pay taxes, or that pays them at the lowest rates, and that represents such a large profit for them that it isn’t surprising to look at the Gini Coefficient and learn that 10 per cent of highest earners in Honduras control 42 per cent of national income, and the lowest 10 per cent of earners only receives 0.17 per cent of income nationally.” These families include the Canahuatis, the Faccusés, the Ferraris, and others. The Facussé family is perhaps in the media spotlight more than some of the country’s other elite families. Carlos Flores Facussé was President from 1998 to 2002. His relative Miguel Facussé is the landowner protagonist in a drawn out land conflict in the Aguán region. The Aguán is a verdant river valley that butts up against the Caribbean Sea. In 2010, more than 2,000 peasant families began to occupy lands granted to them through a federal government program. By the time I visited the Aguán in November 2013, 113 participants in the land occupations had been murdered. We entered La Confianza, one of the largest occupations, after a short check by community guards on a hot, humid weekday afternoon. There was a sense of tranquility in the settlement, where residents were beginning to erect concrete houses beside their original houses with roofs and walls of African Palm. Community members were working to organize into a cooperative to harvest the fruits of the palm plants. All of this self-organization by marginalized peasant farmers has ruffled palm oil magnate Facussé’s feathers. The region is militarized under the pretext that the government needs to fight against drug trafficking. 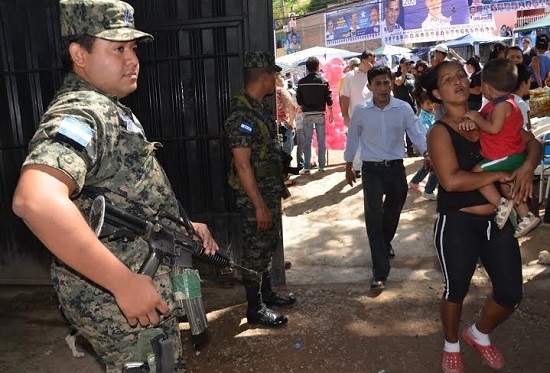 It is not uncommon to see civilians bearing arms in Honduras, nor is it illegal. But in the department of Colón, where the Aguán is located, a new law introduced in August of 2012 prevents the carrying of weapons — but it does not apply to police, soldiers or private security guards. The role of private security cannot be underestimated: the United Nations Working Group on Mercenaries notes that private security guards outnumber police in Honduras five to one. “Security forces apply the law unequally, criminalizing campesinos while providing protection to local businessmen, some reported to engage in drug trafficking,” according to a report by Rights Action, a social justice group with a long history of supporting grassroots struggles in Central America. In this region, there is a blurred line between just who are the police, who are military and who are private security guards, paramilitaries or death squad members. There are special forces, organized into the 15th Battalion and the Joint Task Force Xatruch III, some of whom have been trained by the United States military, while it is Colombians who play a prominent role as trainers of private security guards in Honduras. “We don’t know if they just dress up in the uniforms, or if they are police, or soldiers, or criminals,” said Yoni Rivas, a leader of the Unified Campesino Movement of the Aguán who ran unsuccessfully with the LIBRE party for a congress seat. One of his comrades was kidnapped by around 60 men dressed in military uniforms, but later the Commander of the Joint Task Force Xatruch III German Alfaro Escalante said the kidnappers were part of a criminal group. The various security forces are accused of participating in drug trafficking. “Here army and the private security guards are the same thing. We know that it is the same thing because in October we were organizing a press conference and that same day a small airplane supposedly loaded with drugs crash landed on a clandestine air strip on one of Miguel Facussé’s properties. Then 25 men, dressed in military fatigues, went in in five vehicles, they took the drugs and burned the airplane,” said Rivas, who himself has survived five assassination attempts. The United Nations Office on Drugs and Crime reported in 2012 that drug traffickers in the Aguán region allegedly contracted members of a street gang denominated Mara 61 to defend their operations. Amid the confusion and the proliferation of armed actors in Honduras are US soldiers and special forces. US Special Operations Command South operate in the Aguán and other parts of the country, and the US air force runs an active base at Soto Cano, near Tegucigalpa. There are a handful of new US bases under construction in Honduras, and funding under the Central America Regional Security Initiative has boosted anti-drugs efforts in Honduras under US watch. For 2014, the State Department has requested just over $54 million for Honduras, over $5 million of which is specific to military financing and programs. US assistance to Honduras in combating the drug war has already produced deadly consequences; the 2012 massacre in the Ahuas region of Honduras, when four Indigenous people were shot at from a helicopter and killed in an incident overseen by the US Drug Enforcement Administration. All of these factors together – political violence, gangs, US military presence, impunity, and curtailment of civil rights – have created a maze of militarization and corruption that creates further social and economic challenges for Hondurans living in urban centers and prevents those organizing in rural areas from gaining access to basic resources. This maze of violence ultimately undermines any struggles for political freedom and disproportionately impacts the poorest sectors of the country.